Bold sport coats are an interesting topic. I can recall being drawn to them before off even covered the basics, and wanting them because I liked the one outfit I saw them in. They are fun to wear, often difficult to pair, and usually quite memorable. That’s the challenge if you buy too bold too soon – if one of your first odd jackets is too bold it will quickly become apparent you have a limited wardrobe if you wear it once a week. 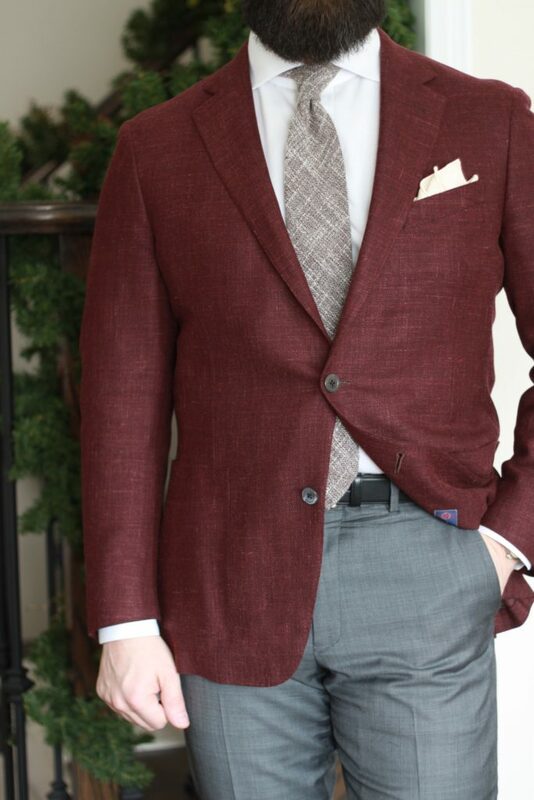 Truth be told, I’ve had my eye out for a burgundy sport coat for at least a year or so. I tried on a beautiful Samuelsohn model made up in what appeared to be a hopsack-like open weave fabric from famed mill Ermenegildo Zegna. To my surprise a buddy of mine came across that exact jacket at a sample sale over a year later. The price was right, so sight-unseen I asked him to pick it up for me. Boy, am I glad that I did. The fabric is sublime – it has a great, soft hand, and the linen in the blend adds the nice hatching effect you can see in the pictures. 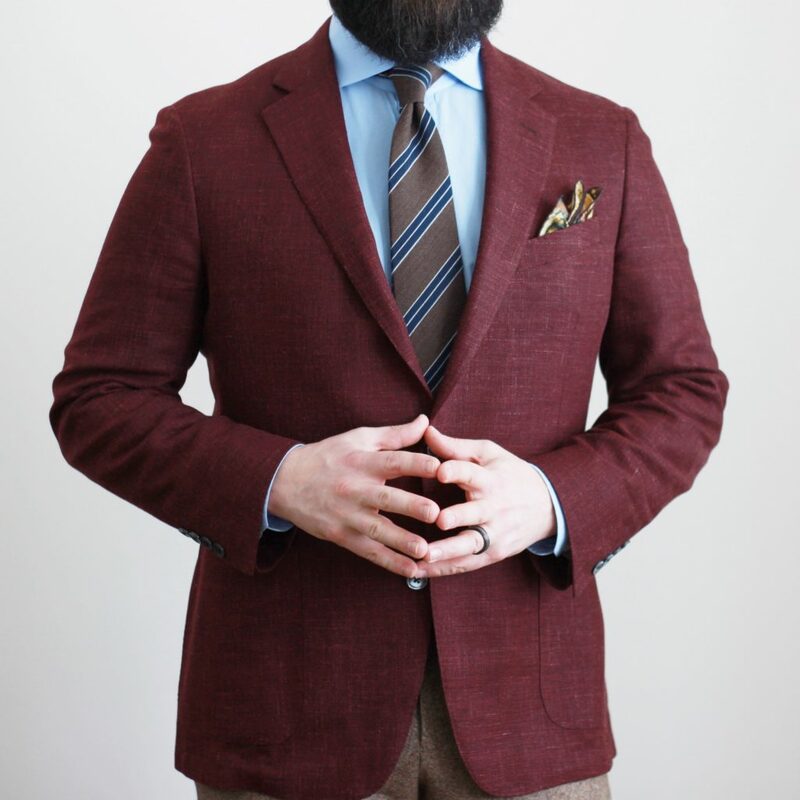 The cut of the sport coat is decidedly not bold, and is in fact fairly traditional; the buttoning point is maybe 1-2 cm higher than I’d like, and the lapels could use 3 or 4 cms in added width. It fits quite well overall, so these details can be overlooked. In this one, I paired the bold jacket with mid-grey trousers, white shirt, cream pocket square, and a brown/white textured cotton and linen tie from Vanda Fine Clothing. I selected the tie because the colour isn’t overly saturated (thanks to the white threads), but has a similar but heavier texture to compliment and balance the texture and vibrancy of the jacket. A white dress shirt seemed the best choice to not enter a competing element, and the cream square was chosen based on my preference to not pair a plain white shirt and square, and to stay in the same colour area as the tie. For this outfit, I went with light grey trousers, a light blue striped shirt, plain white square and a silvery-grey grenadine tie from Kent Wang. In this instance, I let this bold sport coat do all the heavy visual lifting. 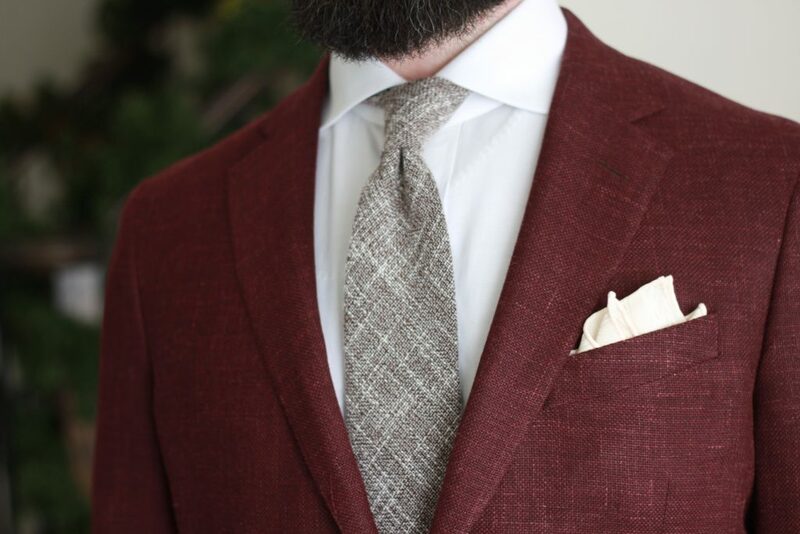 Light grey trousers are pretty ubiquitous, and the low contrast shirt and tie doesn’t draw the eye away from the beautiful burgundy. It’s a bit hard to tell the shirt is striped in light blue as I’m still learning how to use my DSLR outside of the auto setting (ISO was too high). In retrospect, I’m not crazy about the shirt choice here, and maybe a plain light blue would have worked. Of course, I could have gone with white again, but I’m happy to try things even if they don’t work out as well as I’d like. This combo is probably more “out there” in terms of my selections. The tie is a lovely wool striped fabric from the fine folks at Vanda Fine Clothing, worn over a sharp blue poplin shirt, light brown merino tweed trousers with fabric from Abraham Moon & Sons made up by Spier & Mackay, and topped off with the Orion pocket square from Kent Wang. Overall, I thought this outfit was ok. First, what I liked – the warm caramel brown melange of the trousers is a nice textural base for the jacket, and I think the colours play well. In that context I also liked the yellows and browns in the Orion pocket square. If I was to do it again, keeping those three elements, I would have gone with a less saturated blue shirt. I also would have chosen a simpler tie, probably a navy grenadine. I think the stripes are contending with the overall textural feel of the outfit for visual dominance. 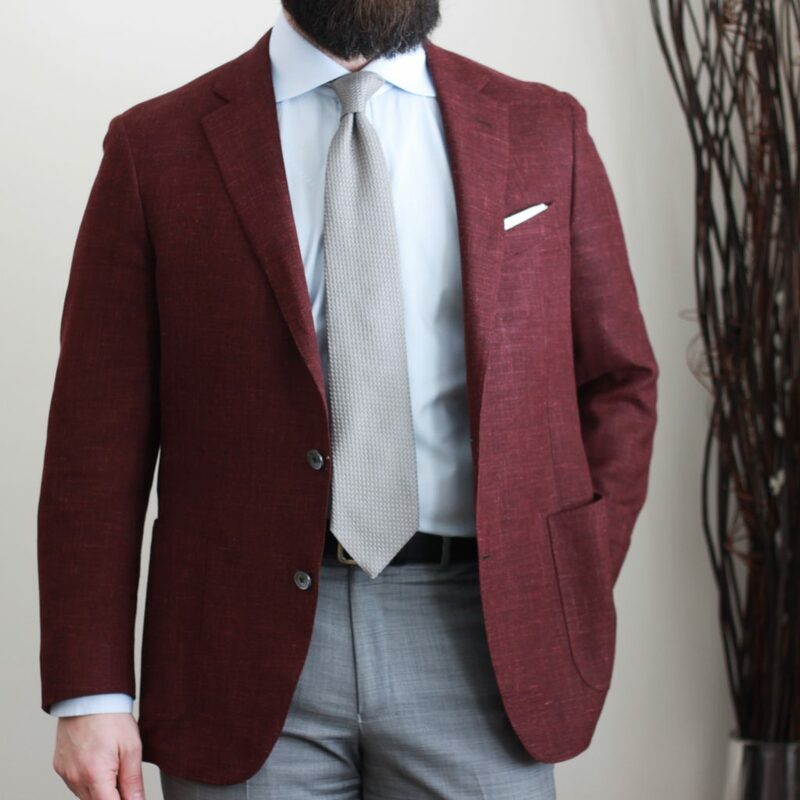 Would you wear a bold, burgundy sport coat? Should I? Hello, would you mind sharing the details on the first tie? The slubby white and beige one? Sure! It’s a linen/cotton blend tie that I bought from http://www.vandafineclothing.com. I just had a look, and it doesn’t seem to be up on the site any more, but hopefully they’ll bring it back again for summer!